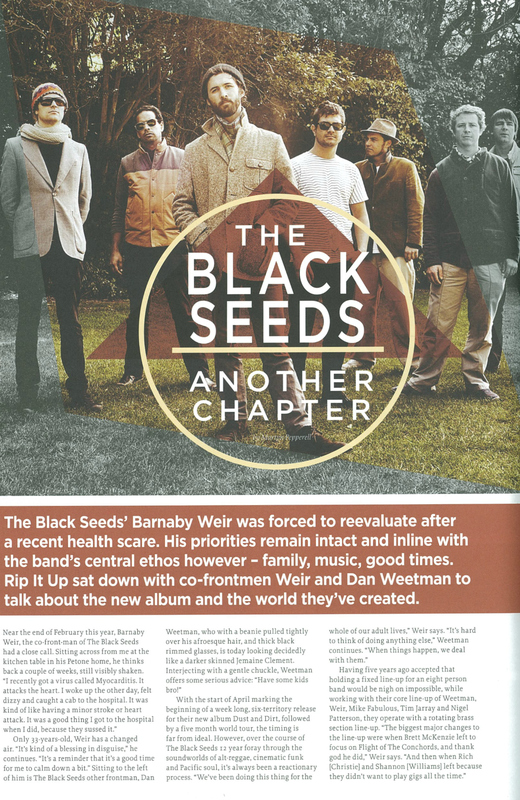 The Black Seeds’ Barnaby Weir was forced to reevaluate after a recent health scare. 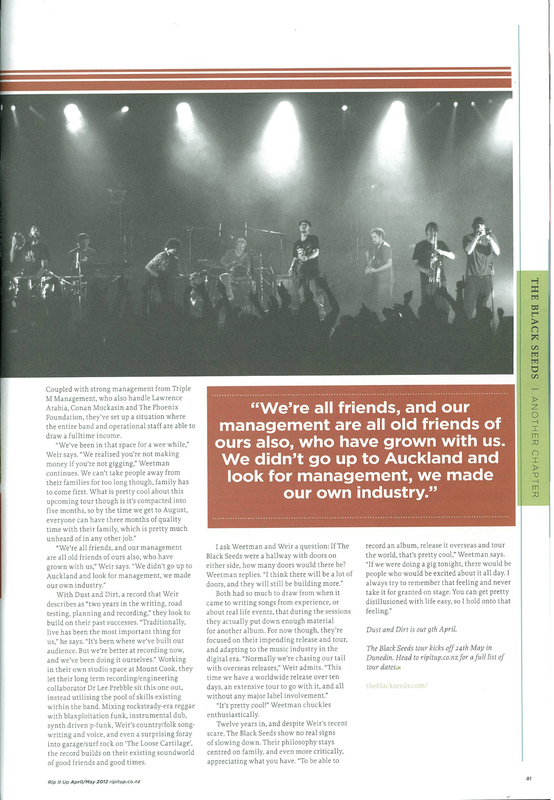 His priorities remain intact and inline with the band’s central ethos however – family, music, good times. Rip It Up sat down with co-frontmen Weir and Dan Weetman to talk about the new album and the world they’ve created. With the start of April marking the beginning of a week long, six-territory release for their new album Dust and Dirt, followed by a five month world tour, the timing is far from ideal. 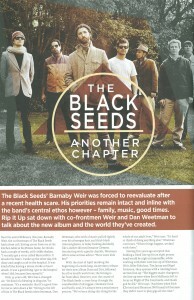 However, over the course of The Black Seeds 12 year foray through the soundworlds of alt-reggae. 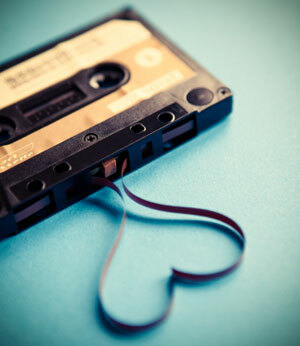 cinematic funk and Pacific soul, it’s always been a reactionary process. “We’ve been doing this thing for the whole of our adult lives,” Weir says. “It’s hard to think of doing anything else,” Weetman continues. “When things happen, we deal with them. Coupled with strong management from Triple M Management, who also handle Lawrence Arabia, Conan Mockasin and The Phoenix Foundation, they’ve set up a situation where the entire band and operational staff are able to draw a fulltime income. With Dust and Dirt, a record that Weir describes as “two years in the writing, road testing, planning and recording,” they look to build on their past successes. 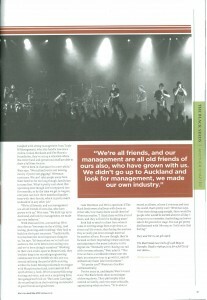 “Traditionally, live has been the most important thing for us,” he says. “It’s been where we’ve built our audience. But we’re better at recording now, and we’ve been doing it ourselves.” Working in their own studio space at Mount Cook, they let their long term recording/engineering collaborator Dr Lee Prebble sit this one out, instead utilising the pool of skills existing within the band. Mixing rocksteady—era reggae with blaxploitation funk, instrumental dub, synth driven p-funk, Weir’s country/folk song- writing and voice, and even a surprising foray into garage/surf rock on ‘The Loose Cartilage’, the record builds on their existing soundworld of good friends and good times. Both had so much to draw from when it came to writing songs from experience, or about real life events, that during the sessions they actually put down enough material for another album. For now though, they’re focused on their impending release and tour, and adapting to the music industry in the digital era. “Normally we’re chasing our tail with overseas releases,” Weir admits. “This time we have a worldwide release over ten days, an extensive tour to go with it, and all without any major label involvement.” “It’s pretty cool!” Weetman chuckles enthusiastically. 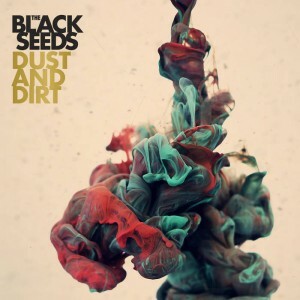 Dust and Dirt is out 9th April. The Black Seeds tour kicks off 24th May in Dunedin. Head to ripitup.co.nz for a full list of tour dates. ‘Another Chapter’ sourced from ‘Rip It Up’ No. 346,8 Apr.-May 2012. Used with permission.